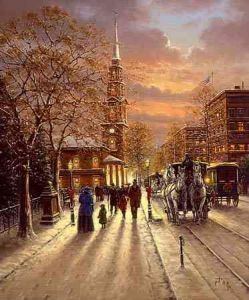 Turn of the century New England is bustling with activity as the lights of the city welcome Christmas Eve. Families and friends are drawn to the stained glass windows of the church as the horse-drawn carriages make their way down the boulevard. The lights glisten across the snow and people gather to begin celebrating 'A Season to Remember."